Square Card is a free business debit card that is connected to your Square balance. Take a payment, and the money you earn is reflected in your balance. You can spend that money with your Square Card anywhere that Mastercard® debit cards are accepted (including in-person, online, and at ATMs). It’s free to order and personalize your Square Card, and it’s free to use your card to make purchases. With Square Card you can you’ll get real-time access to your balance. When you take a payment on Square, that’s money you can spend using the card, without the wait and fees associated with transferring your funds out of your balance. You can manage your Square Card activity from the Deposits tab on your online Square Dashboard. The Overview section shows your upcoming deposits per location. From the Deposit Reports tab you’ll be able to view the status of your deposits. These deposits can be filtered by date and exported as a .CSV file. Clicking on a specific deposit will give you more details on the transaction. The Square Card tab will allow you to manage your Square Card. The Settings tab will allow you edit your deposit schedule for your Square Card balance and link your debit card. Update your Square app to the latest version. From your Square app, go to the new Deposits tab > Square Card. Tap Get Your Square Card. Verify that your name and business name matches the account owner name on Square. For security reasons, Square Cards will only be issued to account owners. Your new Square Card will arrive in 7-10 days. Once your Square Card arrives you can activate it directly from your Square app or online Square Dashboard. 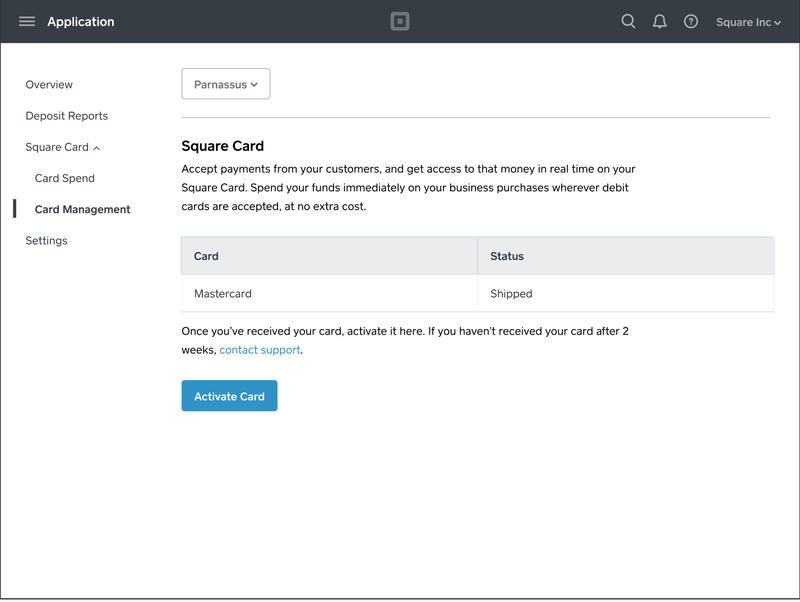 From your online Square dashboard navigate to Square Card. Click on Card Management > Activate Card. Enter the confirmation code sent to the email address associated to your Square account. Once your account has been verified, enter your Square Card CVV and expiration date. Create your 4-digit PIN > Done. From your Square app go to Deposits > Square Card. Tap Activate Card and enter the confirmation code sent to the email address associated to your Square account. Once your account has been verified, connect your reader and swipe your Square Card, or enter your card details manually. Create your 4-digit PIN > Activate Card. Open your app and go to the Square Card section. Tap Problem with Card > select I’d like to cancel my card. In case you need to, you can order a new card by selecting Order Replacement. You can reset your Square Card PIN from your online Square Dashboard. From your online Square Dashboard go to Deposits > Square Card. Next to Status, click on the blue “…” icon. Square does not require you to link a bank account to order a Square Card. If you don’t have a linked bank account when processing a refund or a chargeback, your available balance will be used to cover the refund, and will become negative if the refund amount exceeds the balance. If you already have a linked bank account, in the event of a refund and chargeback your existing balance will be used first, and any shortfall is debited from your linked bank account. Please note: If you’ve accepted a Capital offer, you will need to have a linked bank account. Once you’ve activated your Square Card, your deposits will switch from automatic to manual. Funds you earn will accrue in your Square balance, to ensure that you always have funds to spend with your card. You will still be able to transfer your funds from your balance to your linked bank account at any time, either Next Business Day (free) or with Instant Deposit (1% fee). Open your Square app > tap Deposit to Bank. Choose a deposit speed. You can use Next Business Day Deposit (free) or Instant Deposit (1% fee). Tap Deposit > confirm deposit. You can view your current Square Card balance directly from your Square app or online Square Dashboard. To do so, select Deposits from the menu, then select Card Spend to view your full purchase activity. If you’d like to export your Card Spend as a .CSV file, select the dates you’d like to export and click Export. You will be able to view date, description, amount and whether it’s a personal or business transaction. If your Square Card is lost or stolen, you can cancel and reorder it from your Square app or online Square Dashboard. This will automatically cancel your card. Please note: Square Card will take 7-10 days to arrive. Your funds will continue to accrue in your Square balance while you wait for your new card to arrive, and you can manually transfer that money to your linked bank account at any time. Tap Get help with card. Select Report Lost or Stolen > Order a New Card. Go to the Deposits tab > select Square Card. The maximum you can spend using a Square Card is $10,000 per transaction, $25,000 per day, $50,000 per week, and $150,000 per month. Please note: Weekly limits are not rolling. They reset at the start of every week at 12:01 AM on Mondays. If you’re using your Square Card to withdraw cash, the maximum amount which can be withdrawn at an ATM is $250 per transaction, $1,000 per day, $1,000 per week, $2,000 per month. When withdrawing funds from at ATM, the ATM will probably state your balance is $0.00. This is incorrect. You can check your available funds from the balance section of your Square app. Please note: Square does not charge you any ATM fees, but ATM providers may charge you a fee when you make withdrawals. Square Card helps you to keep business and personal funds separate. However, we understand that sometimes you may use Square Card for personal expenses. To make it easier for you to keep track of your spending, Square Card allows you to categorize your personal and business transactions. 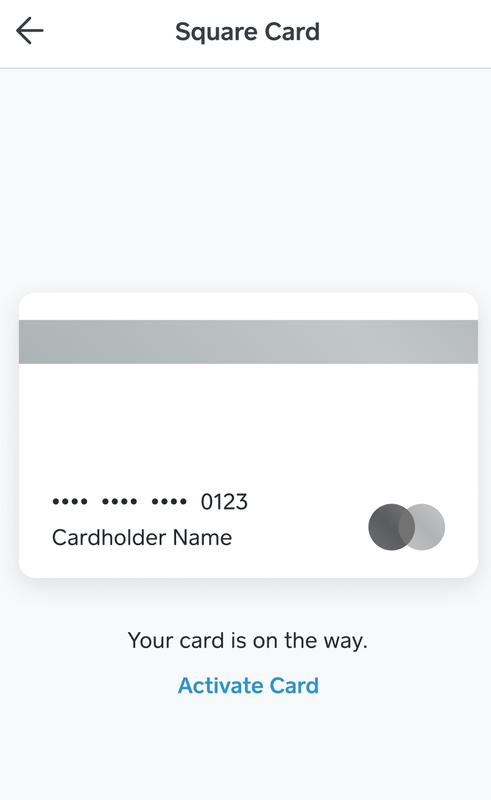 You can change the label on your card transactions from business to personal directly from your Square app or online Square Dashboard, helping you stay organized and save time. Tap or click on Deposits from the menu in your Square app or online Square Dashboard. Navigate to Card Spend > select a transaction. Under Expense Type click or tap on Personal. You will be able to export a CSV file for your expenses by selecting Export > choosing whether you’ll export Personal or Business expenses. Support the Square community by using your Square Card at other small businesses powered by Square, and we give you a 2.75% instant discount. All Square Card sellers are automatically enrolled to benefit from instant discounts at other Square sellers. Check out our FAQs for answers to frequent Square Card questions.